Long gone are those days where sticks, sharpened rocks, and fire were all that we required for preparing a meal. Although that simple set of equipment may be a much easier list to make, you would much rather prefer living in today’s sophisticated world of heat-resistant spatulas and sharpened knives. You will agree that life as a modern-day chef is pretty cool. In case you are new to life in your kitchen or have decided to venture out all on your own to make a variety of different dishes – in particular, the healthy ones – it could be annoying if you do not have all the suitable tools for the job. So, today we will learn about the 5 kitchen products we think are most essential, and thereby most used, to make sure you’re good to go on your grand quest of making some of the finest home-cooked meals. Pans and skillets are essential tools for cooking a variety of foods over a flame, and they are a must in any kitchen. While nowadays non-stick cookware is more popular, a majority of professional chefs like to use traditional cast-iron pans and skillets to cook food. These products do not have chemical coatings like those in nonstick hardware. Also, keep in mind that they will cook your food more evenly. And if you maintain them properly, they could last for generations. If you are into efficient cooking you will like Mealthy MultiPot Programmable Pressure Cooker. Similarly, Digital Countertop Convection Toaster by Oster can be a great addition to your kitchen. 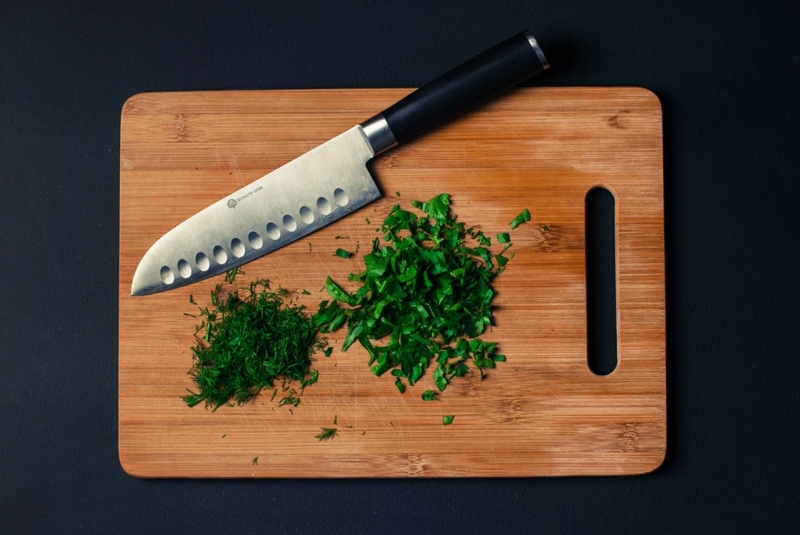 All cooking experts would tell you that a set of sharp and high-quality knives is at the top of their list of kitchen essentials. A sharp knife is one of the most basic and versatile tools. How else will you dice an onion, cut up meat, or slice a block of cheese? Given all the diverse tasks that knives do, it is no wonder you could purchase sets containing 5 to 15 styles. However, if you want the most bang for your buck, go with the simple yet useful chef knife. Its medium size will give you great leverage as well as easy-grip for efficient and quick slicing, chopping, and dicing; also. The long, and tapered blade (which is often about 8 inches) can make it simple to rock while you are cutting. Considered the workhorse of any kitchen, hardwood cutting boards are invaluable. There are very few dinners where chopping and cutting are not involved, which makes these cutting boards your best friend. They are great because they not just protect your precious counter, they also help keep your knives nice and sharp while allowing you to quickly transport cut food and ingredients from one place to the other. Cutting boards made of high-quality hardwood offer adequate cutting space. This is another essential item. If you like baking or trying out novel dishes which require spices as well as other interesting ingredients, then measuring cups and spoons can be a big help. If you follow a recipe correctly and put in the right amount, it can provide you with the best results. However, you may also experiment with various measurements of each ingredient as well. While one set of spoons and cups is essential, keep in mind that two or more sets would let you measure various ingredients in similar amounts. The best part is that you won’t have to wash and rewash. The most popular use of a grater is to shred cheese. That said, this multi-purpose tool is perfect for grating a lot of other flavorful ingredients as well. For example, graters with large holes can shred carrots, potatoes, apples and other ingredients. On the other hand, graters with small holes can grate garlic, ginger, spices as well as citrus peel.